A lot has been said about education ever since the humans have invented the art of learning, and in modern times, a debate has begun and infact gained momentum in the past two decades as to how effective our education system is. This is precisely the question that obliged us to reflect intensely and see for ourselves how we could contribute to this area of vital importance for an upcoming economy like India. This introspection turned into a dream – a dream that was christened Delhi College of Technology and Management, an institute par excellence situated in a spacious lush green campus spread over 12 acres of land in the nature’s lap. Creativity, innovation and intiative are the hallmark of this prestigious college that has been dedicated to the modernisation of education in this region for the past six years. Our institution has been serving the people of various states of India as well as Afghanistan and Nepal producing skilled, efficient and confident professionals for the industries in the surrounding areas of Delhi,NCR and the metropolitan cities. Our primary objective is to instill a sense of discipline in our students so that they may achieve success in their career in future.We encourage them to participate in various sports as well as cultural activities to nurture their hidden talents in an environment that is conducive to their physical, mental and psychological growth; and help them realize their ambitions through perseverance and smart work. We help their youthful minds become assertive not only in their professional career but also in their personal life so that they may positively subscribe to the development of the nation. Special care is taken in imparting necessary knowledge for their all round development because, now a days, degrees alone cannot come to their rescue when it comes to facing the cut throat competition in the job market. Our students are not mere marks machines, quite reverse, they are true learners with high technical acumen coupled with refined soft skills. They have proved their mettle in the past, and Iam sure, will scale new heights in the years to come. In our pain stakingly developed cosmopolitan culture, we have laid down a robust foundation for our budding engineers and managers to march ahead with their head held high and achieve their objectives for a prosperous and powerful India. Various initiatives of the management, relentless persistence of the faculty and over- whelming response of our vivacious students in the extra-curricular activities have yielded positive results. Apart from the regular annual functions and social events like Blood Donation Camps, Organ Donation Awareness Camps and cultural get togethers, we have been organizing co-curricular events like STIC (Soft Skills, Technical Acumen, Industrial Awareness and Confidence Building Activities), Felicitation Ceremony to recognize the students who have secured remarkable jobs in reputed companies. These activities have already borne rich fruit which is abundantly visible in the persona of our young men and women. I am sure, this institute will keep enlightening young talents in the years to come and our product i.e. our exuberant and dynamic students will keep spreading the rays of their wisdom, knowledge, professionalism and ethics in all walks of life and set new standards for others to follow. With these words, I warmly welcome students to the DCTM family. At DCTM, we not only teach, but also inspire! 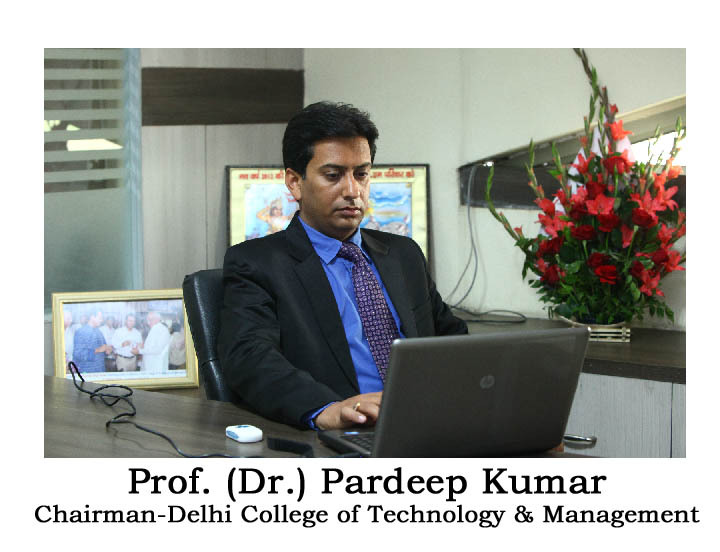 Prof. (Dr.) Pardeep Kumar has 26 years of teaching & research experience. He did his B.Sc. (Hons.) Physics from Delhi University, M.Sc. from Jamia Millia Islamia and Ph.D . from National Physical Laboratory. chairman	He was awarded Research Associate fellowship by CSIR and Research Associate fellowship by DRDO. He has authored 4 books and published 29 research papers in National, International Journals and in the proceedings of International and National conferences. Prof. (Dr.) Pardeep Kumar is a Life Member of Indian Physics Association and Metrological Society of India. His research areas include Laser Photo acoustic, Characterization of materials, ECR Etching & Sol-gel Glass materials. He has major contributions in several major research projects at Jamia Millia Islamia University. Prior to starting this engineering college, he has served in many colleges and universities. His last assignment was with Galgotia College of Engineering & Technology as Dean Academics. He was Professor & Head in Career Institute of Technology & Management (CITM), Manav Rachna Educational Institutions, Faridabad. He was twice awarded with “The Best Faculty Award” at CITM. His administrative experience at CITM included Dean, MRCE, Head (Career Planning Division). He has also been the chief coordinator of IIPC project sponsored by AICTE, New Delhi at CITM, Faridabad. ADDRESS : 77th KM Stone, NH-44 DELHI-NCR, Distt-Palwal, Haryana-121105. CORPORATE OFFICE : 545/1 Floor Chawla Colony, near panchayat Bhawan Ballabgarh - 121104.